Beto O’Rourke is a prolific, prodigious sweater. We’re talking shirt-soaking, chin-dripping sweat, most visible as he takes questions from the audiences that have gathered to see him across Texas. When I first saw pictures of O’Rourke, the El Paso congressman currently vying for Ted Cruz’s Senate seat, soaking through his blue dress shirt at the Houston Juneteenth Parade, I thought: This is the most Texas thing I’ve ever seen. It’s increasingly become a Beto Thing. On the campaign trail, Bernie had his disheveled hair, Trump had chants of “Lock Her Up,” and O’Rourke has his sweat-drenched button-down shirts. Most politicians would mask the sweat with suit jackets, but O’Rourke, who’s already audacious enough to think he could become the first Democrat to represent Texas in the Senate in over 25 years, poses for hundreds of selfies looking like he just got pushed into a pool. On a Sunday morning at the Hill Country Veterans Center in Kerrville — a town of around 20,000 in Texas Hill Country, and the first of three stops for the day — there are 600 people’s body heat to outstrip the air conditioning. Ten minutes after O’Rourke takes the stage, the first signs of sweat start expanding like continents on the back of his shirt. A Beto O’Rourke speech makes people believe that a Democrat can win a major statewide race in Texas. When O’Rourke speaks on the stump, he punctuates his points by moving his left hand up and down, like he’s directing traffic. His voice isn’t particularly melodic; he’s Lincoln-lanky; he lacks the preacher’s cadence that marked former president Obama’s speeches. But O’Rourke’s energy is palpable, infectious; his sweat is the physical evidence of that energy leaving his body. And it seems to be working. Even as he struggles with a continued lack of name recognition, in a state that has consistently voted Republican for the past three decades, recent polling places O’Rourke just two to six points behind Cruz. Among volunteers, there’s cautious yet barely contained glee: Could O’Rourke pull off an upset that, just six months before, seemed impossible? By the time O’Rourke reaches the peaks of his stump speech in Kerrville — advocating for better treatment of Texas’s teachers, arguing for universal health care, and decrying family separation at the border — his shirt is full-on stuck to his back, and the crowd feels ready to ignite. When he announces that he hasn’t taken any money from PACs, instead raising $10.4 million (with an average donation of $33) to Cruz’s $4.6 million over the last quarter, the audience explodes. A politician’s stump speech has the same effect as a good sermon. For those who already believe, it reenergizes the faithful. But a truly great stump speech also appeals to the skeptic — and provides moments of near-spiritual conversion. That’s what a Beto O’Rourke speech does. It makes people believe: believe that the country doesn’t have to feel the way it does right now, that people who think differently can still have a conversation, that you can be conservative and vote for a candidate without an “R” beside their name. While we’re 30 years removed from the election of a Democrat like Ann Richards to run the state — current governor Greg Abbott is a hardline conservative — a Beto O’Rourke speech makes people believe that a Democrat can win a major statewide race in Texas again. And these believers can help make it happen. Rep. Beto O’Rourke hosts a town hall on Aug. 5, 2018, at the Hill Country Veterans Center in Kerrville, Texas. O’Rourke has taken to calling the coming election “the most important of our lives,” which, depending on one’s age, may or may not be an overstatement. But it’s an expression of how many people, including the 10,000-plus who’ve volunteered for his campaign, conceive of it. In supporting O’Rourke, they’re supporting a different vision of both Texas and the United States — one, as O’Rourke emphasizes, in which politicians show up to listen to all citizens, no matter their political inclination, or the size of their town, or their ability to donate to the campaign. One in which Texas — one of the most diverse states in the nation — models an empathetic, progressive way forward for a divided country. It’s not just about convincing voters to swing O’Rourke’s way. It’s about convincing people to vote, period. That more or less sums up the O’Rourke image, refined by grassroots messaging and relentless campaigning over the last 18 months. 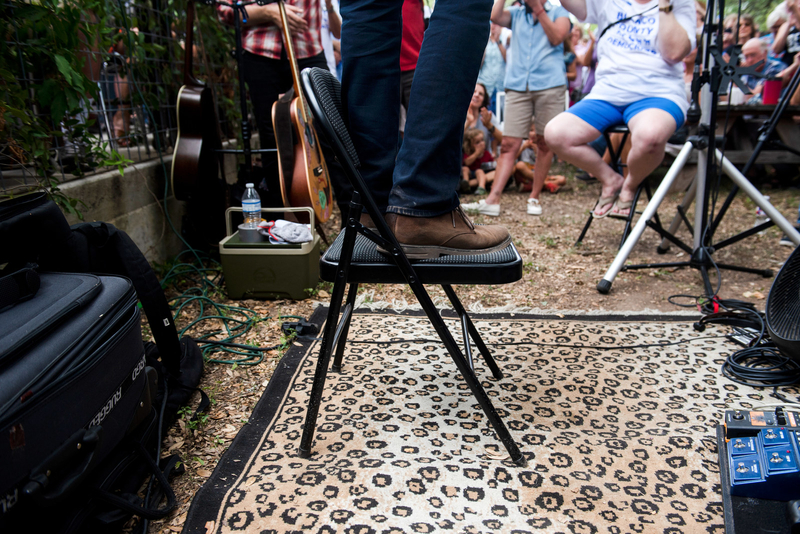 In June, he completed a tour of all 254 counties in Texas before heading right back out on the road to do it again. The campaign proudly employs no pollsters or traditional consultants; until very recently, they’ve rejected the traditional wisdom of focusing money on television advertising. They reject PAC money, even from Democratic funding sources. Instead, they lean heavily on small donations, first-time donations, and Facebook, where livestreams from the campaign trail regularly attract between 20,000 and 80,000 viewers. This sort of campaign philosophy is appealing, but it’s also contingent on the idea that the more people who hear O’Rourke’s message — no matter how red the county, no matter how rural — the more they’ll spread it for him. Yet the campaign faces a daunting reality: To win, O’Rourke has to spread that Beto message in a way that doesn’t just energize Democrats and attract moderates, but activates millions of voters — many of them black and Latino — who, for years, haven’t felt compelled to vote in Texas, either out of apathy or a feeling of futility. That’s a problem that afflicts most of Texas, and flummoxes Democratic organizers. If everyone in Texas voted, the state would almost certainly swing Democrat. But not everyone in Texas votes. For midterm elections, barely more than a third cast a ballot. O’Rourke uses that low turnout like a motivating club: The state is 47th in the nation in voter turnout. The implicit instruction: It’s up to all of you to make us better. Speaking with dozens of hopeful supporters over five days in West Central Texas, it’s clear that the enthusiasm and organization around O’Rourke’s campaign is there. And based on conversations with independent and Republican voters at his events, his message is traveling beyond progressive bubbles. He’s in small towns like Iraan, population 1,236, talking to a dozen people about rural issues like broadband internet; he’s filling theaters in bright red cities like Abilene. He has a veritable army of volunteers. But there’s a gap between energy and obtaining the kind of power that can effect change, and it’s one that it’ll take more than a “blue wave” to fill. It’s not just about convincing voters to swing O’Rourke’s way. It’s about convincing people to vote, period. Like so many other blue-wave candidates across the US during these midterm elections, O’Rourke must convince nonvoters that voting actually matters — that they have the capacity to change their own lives and the lives of those around them. Texas is an enormous and varied state, and one that — no matter how purple its political demographics might seem — still votes red. How many shirts must O’Rourke sweat through to win its heart? Forty years later, the church holds slightly less sway here — students at Abilene Christian University are now allowed to dance, a right they earned in 2012 — but conservative Christianity still defines its political ethos. The Church of Christ doesn’t disseminate politics explicitly from the pulpit, but Baptists do: Every year, the pastor of the biggest congregation preaches a sermon in which he encourages his flock to remain single-issue voters. That issue, of course, is abortion. “We’re not as conservative as, say, Lubbock, but it’s close,” Cheryl Mann Bacon, a retired communications professor at Abilene Christian, told me. According to Bacon, there are three types of conservatives in Abilene: 1) traditional conservatives, with a solid foundation in the political philosophy of conservatism; 2) Trump conservatives, who buy into his more reactionary ideologies; and 3) religious conservatives, who've become increasingly uncomfortable with the way Trump has painted the conservative movement. The first time Bacon realized she might not be a Republican was when she attended the state GOP convention in the ’90s and saw vendors selling Confederate flags lining the wall. Then Karl Rove — the infamously effective political strategist for George W. Bush — sealed the deal: “I could not abide his attitude towards the press,” she told me. “The term ‘compassionate conservative’ has become hackneyed, but that’s where I felt comfortable,” she said. 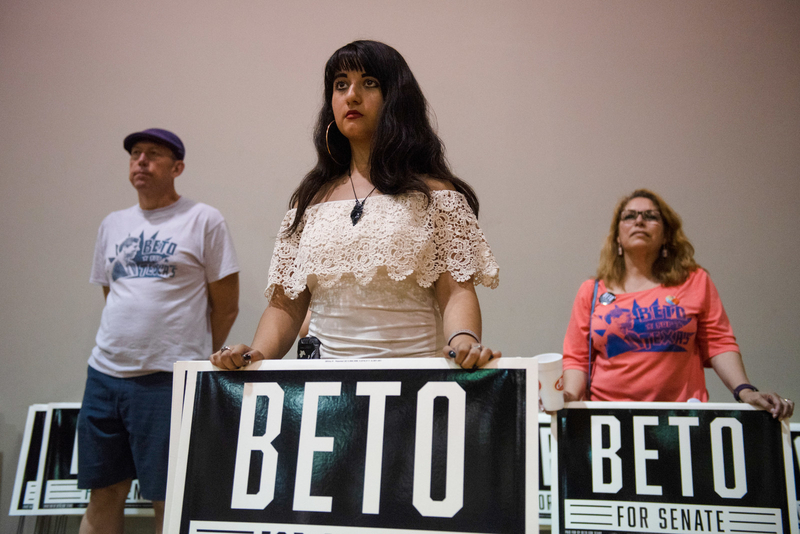 Supporters at a town hall hosted by Beto O’Rourke on Sunday, Aug. 5, 2018, at the Second Baptist Church Community Center in San Antonio. Back in Texas, Cruz seems to have developed a reputation, especially among disenchanted conservatives, as a pompous politician who doesn’t really care about the state. “They hate him in Washington,” one Abilene woman who’d voted for him in 2012 told me. “So how’s he supposed to get anything done?” Multiple people criticized his use of his Senate seat as a stepping-stone to the presidency. Others told me that, well, they just didn’t like his face. And then there’s the way he’s kowtowed to Trump — recently asking the president to campaign for him in Texas — even after Trump disparaged Cruz and his wife, and insinuated Cruz’s father was party to the assassination of JFK (he was not). “A lot of people in this town, Democrats especially, had kinda given up,” Campos-Davis said. “They’d thought that it just didn’t do any good to fight.” Another volunteer told me that Cruz doesn’t even have a district office west of Austin, even though a million people live in El Paso. “East of I-35, politicians just don’t care about us. They think they know what our vote is.” (Senator Cruz's campaign did not respond to requests for comment). In the back row, a retired state worker named Patsy watched the band play a version of Martina McBride’s “Independence Day.” “I’m a Christian, and I don’t believe in gay marriage, and I don’t believe in abortion as a form of birth control,” she told me. “But I think what Christians really want is freedom to impose their beliefs on everyone else, and that’s wrong.” She likes George W. Bush, despises Trump, and voted for Cruz when he ran for Senate in 2012. This time, though, she’s for O’Rourke. “I think he can persuade anyone who’s willing to listen with an open mind,” she said. “Look around,” Campos-Davis said as she welcomed the crowd. “Who’d have thought? !” O’Rourke took the stage amid thunderous, rock-star applause — which started up again when he talked about working across the aisle (“That’s the way we bridge differences and divide”), high-quality universal health care (“All of us are beneficiaries when we invest in all of us”), treating teachers with respect (“Teachers haven’t seen a cost-of-living increase in 13 years”), and child separation (“Imagine how bad things would have to be for you to leave everything you know on foot”). There was no mention of abortion or bathroom bills or NFL protests. Instead, O’Rourke offered a holistic alternative to what he describes as the nastiness of Washington and the discourse that flows from it. “Texas is going to be the big, bold, inspirational answer to all of that,” he said. The crowd, it seemed, agreed. Guadalupe Cervantes hugs Beto O’Rourke during a town hall on Aug. 4, 2018, at Plaza Hall in Del Rio. There are a lot of places in Texas that claim they’re both in the middle of nowhere and the center of the universe, and Del Rio — a border town two and a half hours west of San Antonio — is one of them. In the historic town square, a group of volunteers are stringing up a banner for O’Rourke next to a sign for funnel cakes from another event. They’re expecting around 100 people to show up. It’s a Saturday night, which, in most towns where O’Rourke shows up, would guarantee an overflow crowd. But Del Rio is different. Demographically, it’s solidly Democratic, like so many areas where Latinos are the majority (82% of the county identifies as Hispanic or Latino). But those Democrats just don’t show up. O’Rourke speaks fluent Spanish, but that doesn’t necessarily mean he’s connecting with all Latino voters. O’Rourke speaks fluent Spanish, and regularly dots his speeches with Spanish phrases like “más o menos” instead of “more or less.” On Facebook, campaign event information is posted in both English and Spanish. But that doesn’t necessarily mean he’s connecting with all Latino voters. Supporters of Beto O’Rourke attend his town halls in Kerrville, Johnson City, and Del Rio, Texas. And then there’s the politics of the border. The town operates in symbiosis with the Laughlin Air Force Base, and a solid percentage of its residents are employed directly or indirectly by the border patrol. Thousands pass between Del Rio and its Mexican sister city, Acuña, every day — to work, to shop, to visit family. When a volunteer from Austin told Canseco about spotting a border patrol truck on her way into town, she said, “That’s fucked up.” “No,” Canseco replied. “That’s just a border town.” Unlike in other border towns, there’s no detention facility for those who’ve crossed the border illegally; as Canseco explained, the Democratic resentment of ICE simply doesn’t track here. Inside the Del Rio community center, Sheriff Joe Frank Martinez — tall, swaggering, with a pistol on his hip — leaned against the back wall. He shook hands with Bruno Lozano, the newly elected (and openly gay) mayor, dressed in tight black jeans and a maroon polo shirt. Juanita V. Martinez had driven up from Eagle Pass, another border town, to see O’Rourke with her daughter, who told me that their family was so Democratic that when she was growing up, her grandmother took a photo of Bill Clinton meeting with a local official, cut out the official, and framed the picture on their wall. 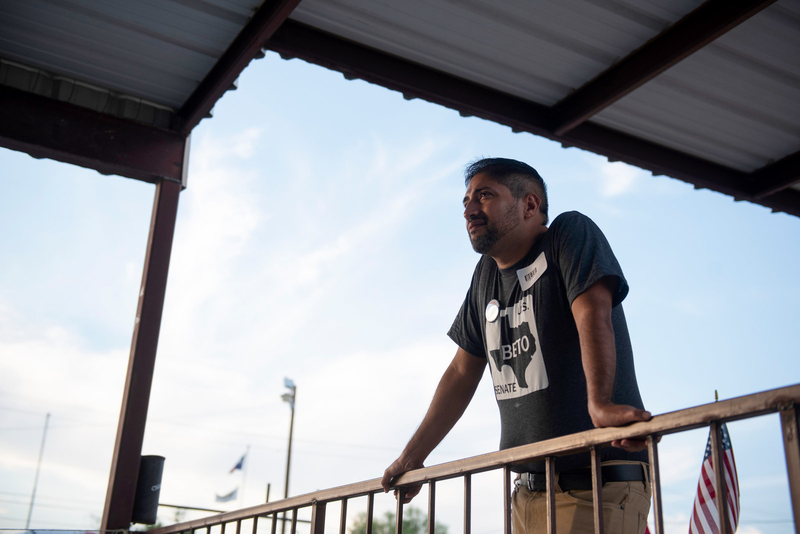 In Eagle Pass, Martinez knows where political signs are and aren’t allowed, the most effective places to put them, the neighborhoods that need door-knocking and rides to the polls on Election Day. But as much as the O’Rourke campaign touts its outreach efforts, it hasn’t been in touch with the Maverick County group, and Martinez hasn’t known whom to contact to get yard signs. Linda Whitney holds a yard sign as Beto O’Rourke hosts a town hall on Aug. 4, 2018, at Plaza Hall in Del Rio. In Del Rio, Markowski Smith told me that the people who usually come out to knock on doors in Latino neighborhoods to get out the vote for local elections are just not out there for Beto yet. Whether that’s because they haven’t been connected to the campaign or they don’t care about O’Rourke as a candidate remains unclear. That man, Canseco said, is a well-known Republican. Kerrville is in the Texas Hill Country, an area that sprawls west of Austin and San Antonio, long popular for weekend escapes: to float the river, to go antiquing, to visit the renowned Gruene Dance Hall, a relic of the area’s German roots and the sort of thing you show to out-of-town guests. It’s not actually any cooler here than it is in the nearby cities, but it feels like the temperature drops 10 degrees. 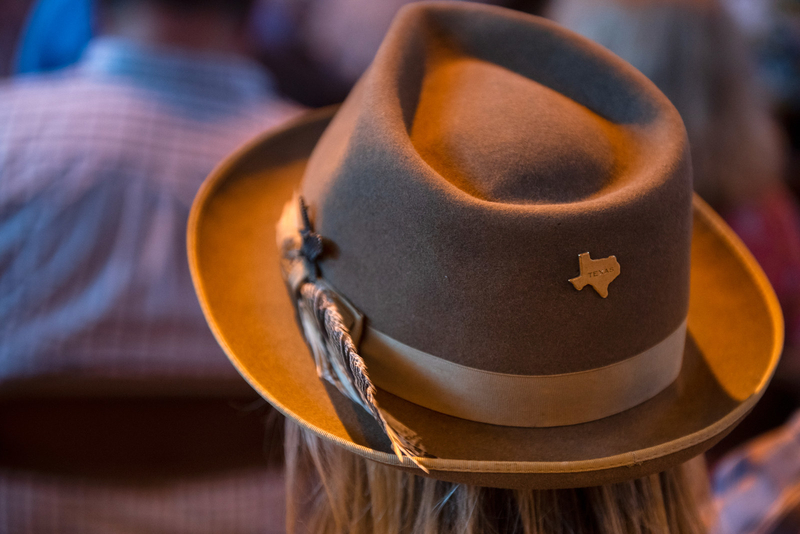 Hill Country’s population has exploded over the last decade, largely with retirees — from California, from the Northwest, from anywhere — looking for a mild climate in a place with a bit more culture than Florida or Arizona. As of 2017, an estimated 27.4% of the county population is over 65. As one attendee described it to me, “there’s a lot of gray hairs out here.” But these fixed-income retirees aren’t the same brand of conservative as those in Abilene; a Kerrville restaurant that put up a Beto banner outside has weathered complaints for months. The county is also very white, especially compared to the campaign’s last stop in Del Rio: 69.1% white, just 26.8% Latino. At the rally, a mix of retirees and twentysomethings filled the chairs, then filled the aisles, then got bounced by the nervous fire marshal. This is where Beto soaked through his shirt for the first time that day, and the audience was thrilled: by him, but also by their own turnout. The walls of the hall were papered with vintage World War II posters, and the ceiling was high and echoey, which had the exhilarating but perhaps deceptive effect, like so much of the campaign, of making every cheer sound like a roar. Supporters of Beto O’Rourke listen to his town hall addresses in San Antonio and Del Rio. O’Rourke prides himself on how much of the driving he’s done during this trip across the state — a good portion of which has been livestreamed. He speeds, but has only been pulled over once (by a cop outside Cooper, in East Texas, who later showed up to the O’Rourke rally). This weekend, O’Rourke’s wife, Amy, is with him in the extended-cab Toyota Tundra, and before the town hall in Del Rio, they picked up their three young children, Ulysses, Molly, and Henry, from summer camp. In Kerrville, I switch places with Ulysses and hop into the truck. A box of carnitas tacos, purchased from the taco truck run by Beto supporters outside the veteran’s hall, gets balanced on my lap. I ask how, when so much of GOP campaigning focuses on “purity tests” to show who’s more conservative, he’s appealing to Republicans. “Somebody played me a clip of a Cruz speech from last week, where he’s like, ‘We’re gonna make Texas bright red!’” he says. “I dunno, maybe that’s successful with the base.” But those GOP voters concerned with purity tests aren’t the ones O’Rourke is courting. Instead, he’s going after voters like his parents and his in-laws. At a town hall hosted by Beto O’Rourke on Aug. 5, 2018, at the Hill Country Veterans Center in Kerrville, Texas. “LBJ Democrat” might be a more useful term for the older Texan O’Rourke is courting. For all of Texas native Lyndon B. Johnson’s cantankerous demeanor, he was responsible for what we now consider some of the most pivotal (and liberal) governmental accomplishments of the last 50 years: combating poverty, fighting for civil and voting rights, education reform, major conservation efforts, and more under his Great Society agenda. “And here we are headed to Johnson City,” O’Rourke says — just miles from where LBJ was born. Beto O’Rourke addresses the crowd during a town hall on Aug. 5, 2018, at 290 Vinery in Johnson City, Texas. At this point, his cadence started speeding up, shifting into a kind of football locker room rallying cry. “What if, in this state — and these other folks don’t know their history, they won’t see it coming from us — what if we led the way to ensure universal, guaranteed, high-quality health care for every American in every single part of this country? What if we led the way?” The crowd clapped through the entire second half of the message: for O’Rourke, but also for the idea that a vote for him could return the state, and its citizens, to their progressive, populist roots. Beto O’Rourke prepares to address the crowd during a town hall on Aug. 5, 2018, at the Second Baptist Church Community Center in San Antonio. For the majority of O’Rourke’s campaign, most of his San Antonio support has come from the more white, more affluent parts of the city, which is one of the fastest-growing metro areas in the country, currently hurtling past 1.5 million residents and overflowing with transplants from Austin, California, and Arizona. The campaign chose this East Side location with the hopes of attracting more of the black residents in the area. O’Rourke tailored his stump speech accordingly, opening with the story of the first person to desegregate the public schools in his hometown of El Paso, and decrying the disproportionate incarceration rate among black men. Beto O’Rourke meets with supporters after a town hall on Aug. 5, 2018, at the Second Baptist Church Community Center in San Antonio. The next day, I met six of the volunteers heading up the O’Rourke volunteer effort in San Antonio at a beer garden just north of downtown. When the campaign first started visiting San Antonio, most of the volunteers were driving down from Austin. “We realized, why aren’t we, the people who actually know this city, in charge?” Alta Compton told me. The core group of volunteers comes from various walks of life: Some are grad students, others are artists, filmmakers, and computer programmers. Some are leftist in their politics, others more centrist. One had her month-old daughter strapped to her chest for the night. Ernest Gonzales is a graphic designer, and spreads out a cornucopia of unofficial Beto stickers he’s made, playing on the logos for the San Antonio Spurs and beloved local grocery store H-E-B. There’s even a Beto-themed car air freshener. Drinking a can of cider, Gonzales’s wife, Devyn, broke down the areas of San Antonio for me: the Northeast, for affluent whites and “passing” Latinos; the largely African American East Side; the neighborhoods where second- and third-generation Mexicans live, compared to the ones where more recently immigrated, largely Spanish-speaking ones make their homes. This group is targeting all of them. “Digital stuff is great, Facebook is great. But what we really look for is that face-to-face interaction,” she said. Beto O’Rourke meets with supporters during a town hall on Aug. 5, 2018, at the Hill Country Veterans Center in Kerrville, Texas. If O’Rourke makes it to the Senate, it will be, at least in part, because voters just flat-out dislike Ted Cruz. But he’ll also owe his victory to those 10,000 volunteers and those millions of energized voters. As the 2016 election demonstrated, most Democrats don’t just want to feel political alignment with a candidate, they want to be enthralled. O’Rourke has generated so much enthusiasm and harnessed so much hope around him, and inspired the incredibly romantic idea that Texas could once again be, if not blue, then at the very least purple — that things could be different. In that way, he’s not unlike another young, first-time, long-shot Senate candidate who grabbed the national imagination a decade ago. That energy is different from what collected around Trump’s campaign in 2016, which was, and remains, rooted in exclusion: the idea that only some people deserve the freedoms and opportunities this country, at its best, can offer. The O’Rourke energy — and that of the blue wave, generally, is about inclusivity: in the identities of the candidates running, in their messaging and policy positions, and in the attempt to get more, not fewer, people to vote. As the 2016 election demonstrated, most Democrats don’t just want to feel political alignment with a candidate; they want to be enthralled. Right now, that seems to be O’Rourke’s party. Their primary turnout (1 million) was less than the Republicans (1.5 million), but 27% of those who voted in the Democratic primary had not voted in the last two midterm primaries. “That suggests there are a lot of Democrats who usually don’t turn out for midterm elections who might be inspired by their anger at Trump to show up at the voting booth in November,” Ratcliffe explains. Still, for O’Rourke to win, he needs to take the rhetoric of inclusion and expand it into strategy, creating a coalition of voters who, even if their views line up with Cruz on abortion and economics, can’t abide the rest of what he and Trump stand for. Objectively, it shouldn’t be this hard for a Democrat to win this race. O’Rourke shouldn’t have to sweat through this many shirts. But voter apathy is not a uniquely Texan problem — and no candidate can persuade every potential voter to believe that their participation matters. What I saw on the ground, then, was O’Rourke’s best attempt to tailor his appeal to so many different types of Texans, including, especially, ones who don’t fall into the neat categories of Republican or Democrat. His message: You matter. Your town matters. Your problems matter. And to convince them, he didn’t alter his own message so much as alter the way he conveyed that he has been listening to their worries all along. On the stump across Texas, it certainly feels like the “election of our lifetimes” that O’Rourke likes to evoke. The stakes feel so much higher than this one political office. At its heart, his campaign is less about vanquishing Republicans than regaining what had once, accurately or not, felt like the core of our national identity: that we are a country of decency, a place where people care for one another. For supporters of O’Rourke or any of the dozen other candidates hoping to make up a “blue wave,” taking back the House — or the Senate — has become a tangible means of returning to that understanding of who we are as Americans. Within this understanding, if O’Rourke wins, some piece of that identity will be redeemed. But what about the very real, even probable, chance that he loses? Beto O'Rourke takes questions from the crowd during a town hall on Aug. 5, 2018, at the Second Baptist Church Community Center in San Antonio. Graphic sources: population and demographic data from 2017 US Census estimates. Election data from the Texas Secretary of State: 2016 presidential election (county by county); statewide historical turnout; 2014 midterm turnout (county by county). Photo: Getty Images. The city of Del Rio, Texas, is west of San Antonio. An earlier version of this post misstated where it is.